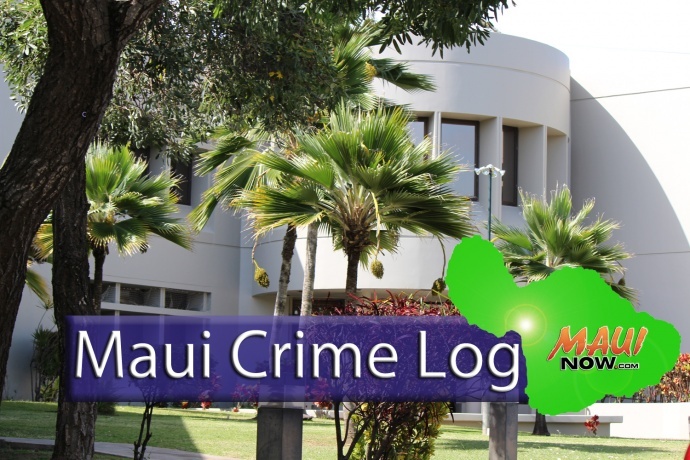 Maui police responded to 28 burglaries, 10 vehicle break-ins, and 29 vehicle thefts in Maui County over the seven-day period between Jan. 11 and 17, 2015. The number of burglaries was up from the previous week. Burglary incidents increased to 28 incidents reported for the week—up from the 20 incidents reported the week before. The number of vehicle break-ins was half the number reported a week earlier. Vehicle break-ins decreased from 20 reported a week earlier to 10 during this reporting week. Sunday, Jan. 11, 2015, 12:53 p.m.: Wailana Place, Kīhei. Non-residential, forced entry. Sunday, Jan. 11, 2015, 6:53 p.m.: Kahekili Highway, Waihee. Residential, forced entry. Monday, Jan. 12, 2015, 6:44 a.m.: Mokulele Highway, Kīhei. Non-residential, unlawful entry. Monday, Jan. 12, 2015, 9:38 a.m.: Hansen Road, Kahului. Non-residential, attempted burglary. Monday, Jan. 12, 2015, 2:41 p.m.: Ku‘ualoha Street, Kahului. Residential, unlawful entry. Monday, Jan. 12, 2015, 4:21 p.m.: Liholiho Street, Wailuku. Residential, forced entry. Monday, Jan. 12, 2015, 5:54 p.m.: Uakea Road, Hāna. Residential, unlawful entry. Tuesday, Jan. 13, 2015, 6:05 a.m.: South Kei Place, Kahului. Residential, forced entry. Tuesday, Jan. 13, 2015, 6:57 a.m.: South Kīhei Road, Kīhei. Non-residential, attempted burglary. Tuesday, Jan. 13, 2015, 7:54 a.m.: Kauhale Street, Kīhei. Residential, unlawful entry. Tuesday, Jan. 13, 2015, 8:28 a.m.: Maka‘ala Drive, Waiehu. Residential, unlawful entry. Tuesday, Jan. 13, 2015, 8:49 a.m.: Poailani Place, Wailea. Residential, unlawful entry. Tuesday, Jan. 13, 2015, 10:04 a.m.: Poailani Place, Wailea. Residential, unlawful entry. Tuesday, Jan. 13, 2015, 6:10 p.m.: West Papa Avenue, Kahului. Residential, forced entry. Wednesday, Jan. 14, 2015, 8:35 a.m.: Mā‘alaea Road, Mā‘alaea. Non-residential, attempted burglary. Wednesday, Jan. 14, 2015, 9:45 a.m.: East Kanamele Loop, Waikapu. Residential, forced entry. Wednesday, Jan. 14, 2015, 1:46 p.m.: Moloka‘i Hema Street, Kahului. Residential, forced entry. Wednesday, Jan. 14, 2015, 8:01 p.m.: Moloka‘i Hema Street, Kahului. Residential, unlawful entry. Thursday, Jan. 15, 2015, 8:33 a.m.: Palapala Drive, Kahului. Non-residential, forced entry. Thursday, Jan. 15, 2015, 8:47 a.m.: South Papa Avenue, Kahului. Non-residential, forced entry. Friday, Jan. 16, 2015, 10:20 a.m.: Ainakea Place, Lāhainā. Residential, attempted entry. Friday, Jan. 16, 2015, 1:46 p.m.: South Lāna‘i Street, Kahului. Residential, unlawful entry. Friday, Jan. 16, 2015, 4:13 p.m.: Pohai Street, Kahului. Residential, forced entry. Saturday, Jan. 17, 2015, 8:08 a.m.: Uakea Road, Hāna. Non-residential, unlawful entry. Saturday, Jan. 17, 2015, 10:48 a.m.: Waine‘e Street, Lāhainā. Residential, forced entry. Saturday, Jan. 17, 2015, 11:01 a.m.: Fraser Avenue, Lāna‘i. Non-residential, unlawful entry. Saturday, Jan. 17, 2015, 2:19 p.m.: Halama Street, Kīhei. Residential, unlawful entry. Saturday, Jan. 17, 2015, 11:08 p.m.: Ka‘ahumanu Avenue, Kahului at Queen Ka‘ahumanu Shopping Center. Non-residential, forced entry. Sunday, Jan. 11, 2015, 11:51 a.m.: Kai Pali Place, Lāhainā. Green 2001 Ford XST. Unauthorized entry motor vehicle. Sunday, Jan. 11, 2015, 1:33 p.m.: Kai Pali Place, Lāhainā. Green 2001 Ford XST. Unauthorized entry motor vehicle. Sunday, Jan. 11, 2015, 3:43 p.m.: Mokulele Highway at Animal Sanctuary in Kahului. White 2011 Chevy Equinox. Unauthorized entry motor vehicle. Sunday, Jan. 11, 2015, 4:33 p.m.: Honoapi‘ilani Highway at McGregor Point dirt parking lot in Mā‘alaea. Black 2014 Dodge Charger. Unauthorized entry motor vehicle and theft. Sunday, Jan. 11, 2015, 4:40 p.m.: West Alu Road and Main Street at Kapilau Ridge Trail in Wailuku. Silver 2010 Kia Spectra. Unauthorized entry motor vehicle and theft. Sunday, Jan. 11, 2015, 6:18 p.m.: Kapukaulua Place and Stable Road in Spreckelsville. Gold 2005 Scion XB. Unauthorized entry motor vehicle. Monday, Jan. 12, 2015, 8:31 a.m.: Alahama Street in Kahului. White 1992 Toyota Tacoma. Unauthorized entry motor vehicle and theft. Monday, Jan. 12, 2015, 12:20 p.m.: Hāna Highway in Ha‘ikū. Red 2013 Jeep Wrangler. Unauthorized entry motor vehicle. Monday, Jan. 12, 2015, 5:11 p.m.: Hāna Highway at Twin Falls in Ha‘ikū. Silver 2015 Subaru. Unauthorized entry motor vehicle and theft. Monday, Jan. 12, 2015, 6:09 p.m.: Hāna Highway at Twin Falls in Ha‘ikū. Blue 2013 Jeep Wrangler. Unauthorized entry motor vehicle. Monday, Jan. 12, 2015, 9:30 p.m.: Kanaloa Avenue at War Memorial Baseball Field in Wailuku. Grey 2014 Lexus IS250. Unauthorized entry motor vehicle and theft. Tuesday, Jan. 13, 2015, 6:36 a.m.: Pakaula Street at Walmart in Kahului. Grey 2006 Ford Ranger. Unauthorized entry motor vehicle. Tuesday, Jan. 13, 2015, 8:09 a.m.: Hāna Highway in Kahului. White 2011 Nissan Frontier. Unauthorized entry motor vehicle and theft. Wednesday, Jan. 14, 2015, 4:30 p.m.: Hui Road in Nāpili. Light Blue 2003 BMW X5. Unauthorized entry motor vehicle. Wednesday, Jan. 14, 2015, 4:53 p.m.: Calasa Road at Kula recreation Center in Kula. Green 2009 Honda CRV. Unauthorized entry motor vehicle and theft. Wednesday, Jan. 14, 2015, 5:55 p.m.: Hāna Highway at Nature Walk in Ha‘ikū. Blue 2002 Toyota 4-Runner. Unauthorized entry motor vehicle and theft. Wednesday, Jan. 14, 2015, 6:35 p.m.: Front Street at Mala Ocean Tavern in Lāhainā. Silver 2014 Dodge Avenger. Unauthorized entry motor vehicle and theft. Thursday, Jan. 15, 2015, 5:50 a.m.: Wahine Pio Avenue at Keopulani at Wahine Pio in Kahului. White 2007 Ford F250. Unauthorized entry motor vehicle and theft. Thursday, Jan. 15, 2015, 4:24 p.m.: Kahekili Highway and Malaihi Road at Mac Nut Fields in Waiehu. Silver 1997 Honda Accord. Unauthorized entry motor vehicle. Thursday, Jan. 15, 2015, 8:30 p.m.: Luakaha Circle in Kīhei. Green 1995 Jeep Cherokee. Unauthorized entry motor vehicle and theft. Friday, Jan. 16, 2015, 9:33 a.m.: Hāna Highway in Pā‘ia. Blue 2014 Nissan Altima. Unauthorized entry motor vehicle and theft. Friday, Jan. 16, 2015, 9:33 a.m.: Hāna Highway in Pā‘ia. Grey 2011 BMW X5. Unauthorized entry motor vehicle and theft. Friday, Jan. 16, 2015, 9:33 a.m.: Hāna Highway in Pā‘ia. White 2005 BMW X5. Unauthorized entry motor vehicle and theft. Friday, Jan. 16, 2015, 9:33 a.m.: Hāna Highway in Pā‘ia. White 2005 Mini Cooper. Unauthorized entry motor vehicle and theft. Friday, Jan. 16, 2015, 9:33 a.m.: Hāna Highway in Pā‘ia. White 2008 Ford Ranger. Unauthorized entry motor vehicle and theft. Friday, Jan. 16, 2015, 3:36 p.m.: Ho‘okele Street and Mokulele Highway in Kahului. Silver 2009 Subaru Forester. Unauthorized entry motor vehicle. Friday, Jan. 16, 2015, 7:02 p.m.: Dairy Road in Kahului. White 2002 Chevy Silverado. Unauthorized entry motor vehicle and theft. Saturday, Jan. 17, 2015, 11:43 a.m.: Ala Malama Avenue in Kaunakakai. Brown 1999 Chevy Blazer. Unauthorized entry motor vehicle and theft. Saturday, Jan. 17, 2015, 7:40 p.m.: Mākena Road at Big Beach in Wailea. 2000 Dodge Caravan. Unauthorized entry motor vehicle. Sunday, Jan. 11, 2015, 7:28 a.m.: South Kamehameha Avenue in Kahului. Grey 2014 Honda CRV, license #LEV368. Sunday, Jan. 11, 2015, 9:07 a.m.: South Kīhei Road at Kamaole Beach Club in Kīhei. Blue 2000 Harley Motorcycle, license #369MVF. Sunday, Jan. 11, 2015, 10:07 a.m.: South Kīhei Road at ABC Store in Kīhei. Black 1995 Honda Motorcycle, license #341MVF. Sunday, Jan. 11, 2015, 2:30 p.m.: Hina Avenue in Kahului. Red 2003 Toyota Tacoma, license # NJF009. Tuesday, Jan. 13, 2015, 6:09 a.m.: Ho‘owaiwai Loop in Wailuku. Cream 1990 Honda Civic, license #RDJ008. Tuesday, Jan. 13, 2015, 3:10 p.m.: Lono Avenue at Maui High School in Kahului. Beige 1986 Toyota Tacoma, license #FWG436. Wednesday, Jan. 14, 2015, 2:44 a.m.: Pakaula Street at Walmart in Kahului. Blue 1997 Honda Accord, license #MHJ070. Thursday, Jan. 15, 2015, 3:10 p.m.: Lower Honoapi‘ilani Road in Nāpili. Red 2013 Genuine Moped. Friday, Jan. 16, 2015, 11:30 a.m.: Ritz Carlton Drive at Ritz Carlton Kapalua in Kapalua. White 2015 Nissan Altima, license #LEY248. Saturday, Jan. 17, 2015, 4:33 p.m.: Makawao Avenue in Makawao. Blue 2000 Mercedes-Benz ML320, license #LAH923.